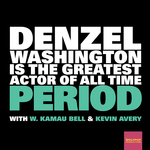 Special guest Kathryn P. McMurphy returns to discuss the 1995 neo-noir mystery Devil in a Blue Dress with Kevin & Kamau. They talk about Denzel passing the ball to Don Cheadle, try to figure out the deal with that guy cutting up all the trees in the movie, and get into the sexiest Denzel moment in film history. Plus, a quick update on Carbon Copy! Don Cheadle! Don Cheadle! Don Cheadle!